Adding roasted vegetables to a store bought marinara sauce boosts the nutritional value, and makes a deliciously sweet sauce. 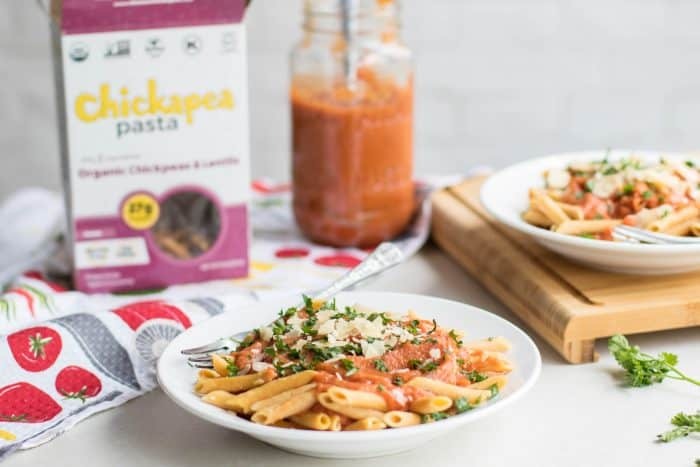 Thanks to Chickapea for partnering with us we use this sauce to top Chickapea pasta — it has 27 grams of protein per serving, so paired with veggies, this is a complete meal that kids will love! If your kiddos are anything like mine then you appreciate recipes that “sneak” vegetables into their diet. My girls love corn and green beans, but that’s about it. They’ll pick through a recipe where they can see the vegetables in the sauce. We’ve even gone so far as for them to plant their own herb gardens in hopes that they’ll be more likely to try recipes that incorporate the herbs. That strategy is often hit or miss though so I’m always trying to create recipes that hide the vegetables in the meal. Our Veggie Pasta Marinara hides all sorts of vegetables, but more importantly it hides ones like carrots, zucchini and cauliflower, which my girls won’t touch never mind eat. My youngest loves seasoning the vegetables and being part of the process in the kitchen, but if she can see the vegetables then we’re in for it. Do you understand my pain? I know you do, which is why we’re making this super simple to get those veggies in. Plus, it doesn’t get much easier than this recipe. You know I’m all about easy. This is four ingredients into a blender and then poured over Chickapea pasta. Avery also loves this recipe because she gets to use the blender, which I’m sure you’ve seen on my Facebook Live stream. She has a tendency to scream along with the sound of the blender’s motor, which of course in turn causes the dog to go nuts. What’s cooking without a little bit of chaos though right? Chaos is definitely part of our daily meal preparation, but it’s a chaos that brings laughter and love into the kitchen. Just check it out in the video below! I always want my girls to feel like the kitchen is a place where they can explore their love of food and what better way to do it then with the fleeting moments that we often take for granted. As many of you know I wasn’t always confident in the kitchen. I avoided it like the plague because I always felt like I’d make a mess in my mom’s kitchen. I always felt grounded though when we came to the table as a family to enjoy a meal. It was often over a pasta recipe, which I’ve carried on with my family. There is nothing quite like a comforting pasta recipe to bring a family together. Luckily, Chickapea pasta makes it easy to bring a pasta recipe to the table that is comforting, but also nutritious. Chickapea pasta contains 27 grams of protein per serving and is gluten free since it is made from chickpeas and lentils. I love knowing that I’m bringing the chaos into my kitchen to place a nutritious meal on the table for us to enjoy as a family. 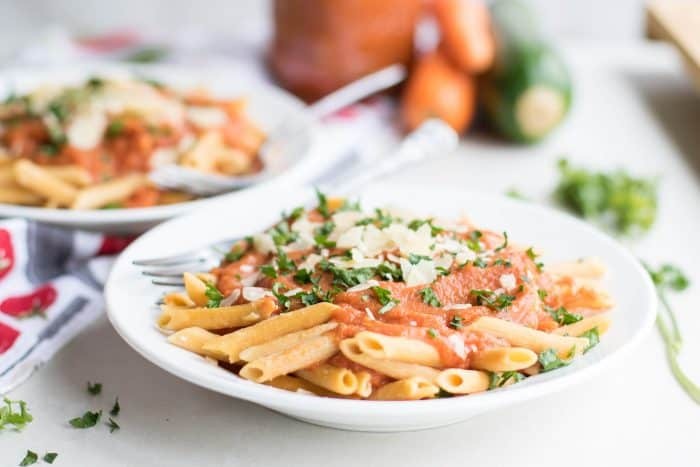 Adding roasted vegetables to a store bought marinara sauce boosts the nurition value, and makes a deliciously sweet sauce. 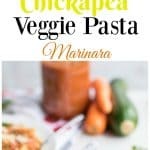 Use this sauce to top Chickapea pasta -- it has 27 grams of protein per serving, so paired with veggies, this is a complete meal that kids will love! 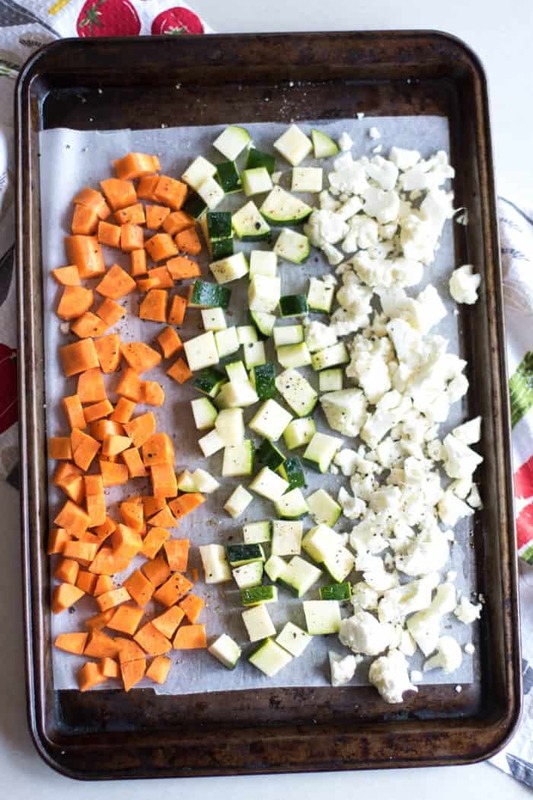 On a baking tray, add roughly peeled and chopped carrot, chopped zucchini, and cauliflower florets. These will be pureed into the sauce, so no need to cut them a certain way. Drizzle vegetables with olive oil, and season with sea salt and black pepper, to taste. Roast vegetables for 15 minutes. While vegetables are roasting, cook Chickapea pasta. The pasta cooks well al dente, but cook it to your liking. 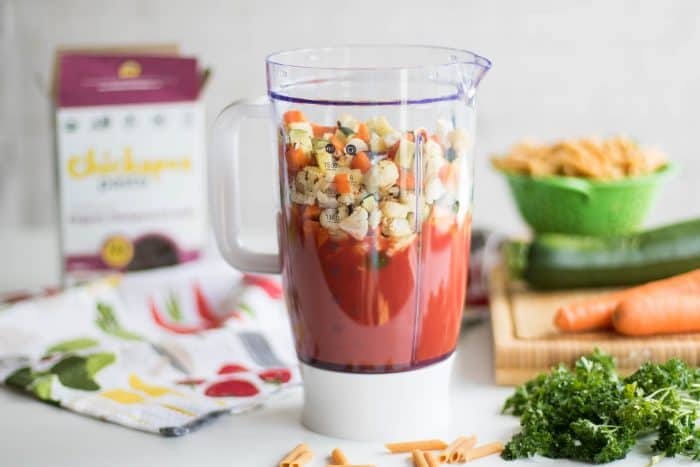 In a blender, add jarred pasta sauce, roasted veggies, and ⅓ cup of water. Puree until the sauce reaches a desired texture. Add more sauce to thin out if necessary. Add to a sauce pot to heat up. Depending on the sauce you choose, you might need to add a few extra spices. Season with sea salt, black pepper, Italian seasoning, and cumin. Serve sauce over pasta, and garnish with parmesan and parsley. During a busy week, I want something that I can prepare quickly but is still healthy. This is pure comfort food with all the best nutrients. Perfect! This marinara sauce sounds so good! Chickapea Pasta is our family’s favorite. We eat it all the time/. I’m in love with the execution of these sneaky veggies all up in this dish – well done! Totally trying this delish dish with my family – we love our Chickapea Pasta like woah! 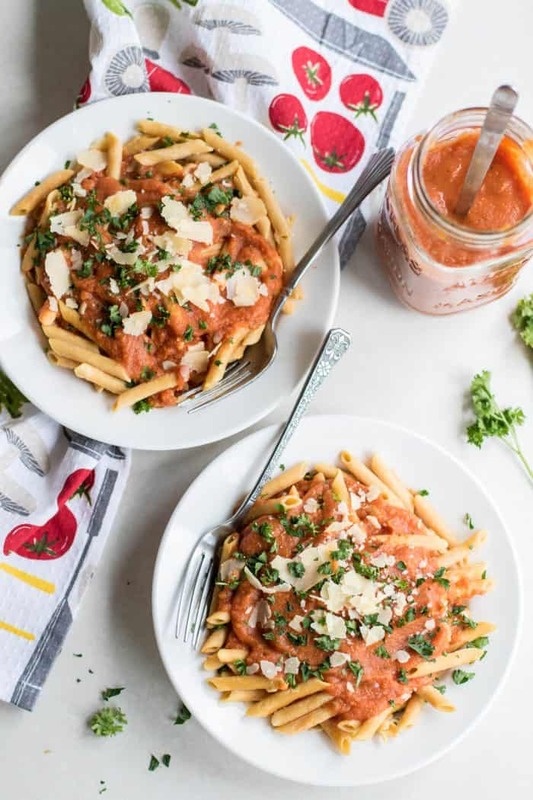 This is such a wonderful way to get more veggies and flavor into a marinara sauce! I just love Chickapea pasta and this is such a wonderful wholesome meal! What a wonderful recipe! This is just brilliant and I bet it taste fantastic. I am a big fan of Chickapea Pasta so I know it would be great in this dish. Can’t wait to try it! I love that you made your own roasted veggie sauce. that’s even more nutritious! Gosh I bet it pairs perfectly with chickapea! MUST MAKE! 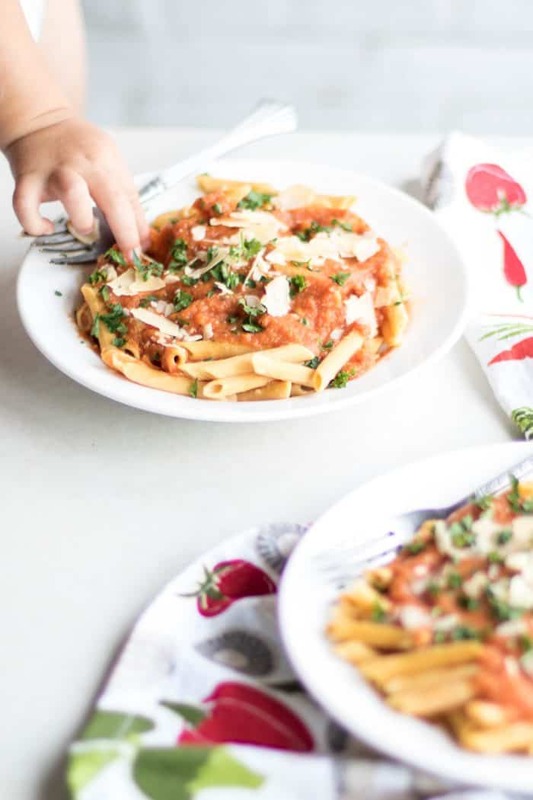 I have no kiddos Jenny but this pasta marinara dish is adult friendly too!! Especially with Chickapea Pasta. It’s my go – to pasta now. I just don’t get bloated from eating it like I do with regular wheat pasta. And paired with the gorgeous veggie sauce mixture you’ve made here, is totally healthy and wholesome. I’ll take a whole pot please! !